Oyster lovers rejoice. There is a new book on the market that you should rush out to buy. Not next week, not even tomorrow – go and buy this book right now. Written by Jairemaire Pomo, The Hog Island Oyster Lover’s Cookbook is a delightful romp through the world of oysters in general and Hog Island’s offerings in particular. Jairemaire has succeeded admirably in capturing the passion, enchantment, and mystic that have surround oysters throughout history. It’s an easy read that will probably make you laugh out loud at times. But make no mistake, this 168-page volume is packed with information. 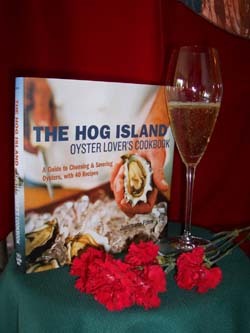 From step-by-step instructions on safely shucking oysters with flair to a concise overview of the varieties, history, and even how to order oysters in a restaurant, once you’ve finished The Hog Island Oyster Lover’s Cookbook, you’ll be in oyster heaven. Only one cautionary note. If, like both of us, you’re already an oyster aficionado, you will definitely be heading to your nearest supplier. There are 40 recipes for oysters – both raw and cooked. Oysters with cucumber, lime, and sake; oysters with lemon ice and caviar; oyster and shrimp gumbo; poached oysters with crème fraiche and caviar – okay, so we enjoy caviar almost as much as oysters. This is a problem? This entry was posted in oysters and wine and tagged Calvin Klein, Cooking, Fish and Seafood, Home, Oyster, oysters and wine, Shellfish, Shopping, Vancouver. Bookmark the permalink.